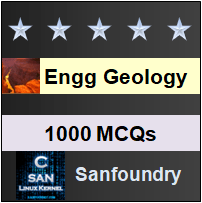 This set of Engineering Geology Multiple Choice Questions & Answers (MCQs) focuses on ” Joints Terminology”. 1. What is responsible for jointing of rocks? Explanation: We may find quite a large proportion of outcrop of any of these rocks practically free from joints at some places, but at other places the same type of rock may be heavily jointed, showing cracks of greater variety. Hence it is not only genesis of the rocks which responsible for these structures but also the forces acting on them. Explanation: Joints are defined as divisional planes or fractures along which there has been no relative displacement. 3. State true or false. Joint is always accompanied by opening. Explanation: Joints may be open or closed. Open joints are those in which the blocks have been separated or opened up for small distances. In closed joints, there is no such separation. Explanation: Open joints are those in which the blocks have been separated or opened up for small distances in a direction at right angles to the fracture surface. These may be gradually enlarged by weathering processes and develop fissures in the rocks. Explanation: There may be or may not be an opening up of blocks perpendicular to the joint planes. Hence the joints may be of open or close nature. Explanation: The joints which are quite prominent and extending for considerable depth and thickness are called as continuous joints. 7. What are the continuous joints also called? Explanation: The continuous joints are also called often as master joints. Almost all joints are discontinuous in the strict sense because these disappear with depth in the crust of the earth. Explanation: In many cases, open joints get filled up by solutions of secondary materials which crystallize or precipitate there forming thin or thick streaks or bands of the filling material. These are simply called veins. Explanation: The thin or thick filling material in the joints of the rocks are called as veins when thin and when their thickness exceeds 20 cm they are called fissure veins. 10. Joints do not have dip and strike. State true or false. Explanation: Joints have dip and strike, the dip being their inclination with the horizontal and the strike being the direction of intersection of a joint plane with a horizontal plane. 11. Pick the wrong statement. Explanation: A joint set is a group of two or more joint surfaces trending in the same direction with almost the same dip. Explanation: A joint system is a group of two or more joint sets. A joint set is a group of two or more joint surfaces trending in same direction with almost same dip.